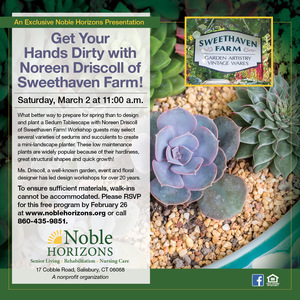 What better way to prepare for spring than to design and plant a Sedum Tablescape with Noreen Driscoll of Sweethaven Farm! At 11 a.m. on March 2, workshop guests may select several varieties of sedums and succulents to create a mini-landscape planter (planters provided). These low maintenance plants are widely popular because of their hardiness, great structural shapes and quick growth! Ms. Driscoll, a well-known garden, event and floral designer, has led design workshops for over 20 years. Registration by February 26 is required for this free program (to ensure sufficient materials) at www.noblehorizons.org or 860-435-9851. We regret that walk-ins cannot be accommodated. Noble Horizons is located at 17 Cobble Road in Salisbury, CT.